The bridge over Barcus Hollow Road was washed downstream, leaving some residents without access to nearby roads. County workers are expected to create a temporary bridge. A bridge on Little Bullskin Road was knocked awry during the storms earlier in the week. 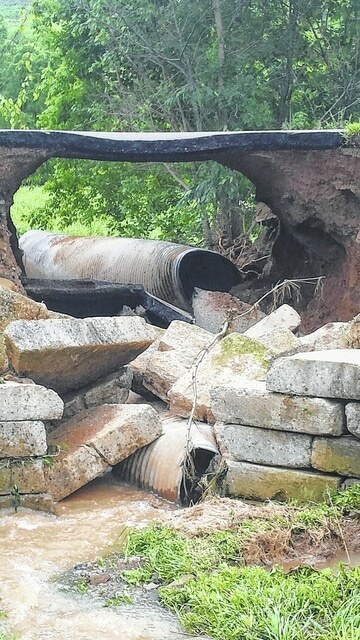 Here is a culvert washed out on Lincoln Pike. According to the Gallia County engineer, vehicles traveling over this were being held up by a mere few inches of asphalt. Had the asphalt broken, a vehicle could have taken a 15-foot drop into the culvert. GALLIPOLIS — Gallia County officials are taking stock of countywide damage from severe thunderstorms earlier in the week in hopes of tapping into Federal Emergency Management Agency funds to aid in infrastructure reconstruction. Gallia County Commissioners met 7:15 a.m. July 14 to declare a state of emergency for all of Gallia County due to overnight flooding “resulting in multiple rescues and damages.” The Gallia County Emergency Operation Center’s activity jumped the same morning. According to Montgomery, the state must declare emergency status for a region before it can make a request for the federal government to declare the counties in emergency. “If that’s the case, we (the county) get 75 percent funding from the feds. The state can come up with the other 25 percent, but by statue they only have to come up with 12 and a half percent,” Montgomery said. Commissioners noted in their experience as county residents it was some of the “worst flooding they’d ever had” and that they “took action early on” to push the reconstruction process forward as quickly as possible. Commissioners estimated there to be somewhere around $8 million to $9 million in damage to private and public property countywide. Damage values are still in the process of being assessed more accurately, though. Gallia County Engineer Brett Boothe said in terms of county roads and infrastructure alone, the county had suffered somewhere around $4 million in damage to its structural integrity. He noted many of the gravel roads in the countryside were simply mud paths now as much of the material placed on them washed away during the storms. Boothe noted county workers were doing the best they could to build temporary bridges for individuals in immediate need in some of the remote areas of the county, as well as to rectify the most dangerous road situations. The engineer also said that individuals with knowledge about flood damage should contact county officials to better help in FEMA damage assessments. “Currently, we are doing damage assessments to determine if we will be able to receive FEMA assistance through the state of Ohio,” Gallia County 911 and EMA Director Sherry Daines said. Daines explained that damage assessments will only be done to homes; vehicles, fences, and outbuildings are not considered living spaces, so they cannot be included in the report to the state. “We are aware that there are still people that have not called to report damage to their homes, and we want to make sure that we have a comprehensive list of damages to report to the state Emergency Management Agency,” she added. Anyone who has experienced damage can call the Gallia County EMA at 740-441-2036. Officials will gather information and send out an assessment team. Visits can take anywhere from 30 minutes to one hour. For more information, visit www.fema.gov. Dean Wright can be reached at (740 ) 446-2342, Ext. 2103.